The user interface is available at guitenet.org. PyTeNet is hosted at GitHub. Together with Edwin, I implemented the "Determinant quantum Monte Carlo" code (C with Intel MKL) used for the computations in the paper, available at GitHub. See also the news announcement at SLAC. I implemented and ran the numerical simulations in the paper, based on matrix product operators (MPOs). The source code is available at GitHub. Detailed derivations related to the publication "Searching for the Tracy-Widom distribution in nonequilibrium processes" below. Using Wigner functions derived from kinetic theory to study thermalization. Motivated by the active research field "thermalization of isolated quantum systems". The height fluctuations for one-dimensional growth models in the Kardar-Parisi-Zhang universality class are governed by the random matrix Tracy-Widom distribution. Here we demonstrate that the Tracy-Widom distribution also occurs for the Leroux stochastic lattice gas and hard-point particle chains with alternating masses, when starting from domain wall initial conditions. The result is expected to be general, and should also hold for other anharmonic chains and one-dimensional quantum fluids. A Mathematica implementation of the algorithm described in the paper is available at GitHub. The algorithm is an improved version of the LS diagonalization step used in the paper "Efficient algorithm for asymptotics-based configuration-interaction methods and electronic structure of transition metal atoms" below. Nonlinear fluctuating hydrodynamics applied to the discrete nonlinear Schrödinger equation. At low temperatures, the "superfluid velocity" is almost conserved, which opens a "second sound" transportation channel. An alternative functional for DFT calculations enables simulations of ultracold gases with long-ranged interactions. Also refer to the paper "Wigner localization in quantum dots from Kohn-Sham density functional theory without symmetry breaking" below. Development and implementation of an efficient algorithm for the spatially inhomogeneous matrix-valued quantum Boltzmann equation derived from the Hubbard model. Also compare with the Boltzmann-Hubbard papers below concerned with the one-dimensional case. The C source code for the simulations can be found at here, and a Mathematica package and demonstration file for calculating the G coupling constants here. See also the papers "Equilibrium time-correlation functions for one-dimensional hard-point systems" and "Dynamic correlators of Fermi-Pasta-Ulam chains and nonlinear fluctuating hydrodynamics" below. Lattice Boltzmann method (LBM) with quantum aspects: Fermi-Dirac equilibrium functions instead of Maxwell-Boltzmann, and matrix-valued spin density matrices as distribution functions. See also the video in the software section. Matrix-valued multi-component Boltzmann equation derived from a general quantum field Hamiltonian. We illustrate the approach to equilibrium by numerical simulations in the isotropic three-dimensional setting. Finite element discretization of the optimal transport map for N = 2 electrons. Comparing molecular dynamics simulations of hard-point chains with predictions from nonlinear fluctuating hydrodynamics. A slightly improved version of the C source code used for the simulations can be found here, and a Mathematica package and demonstration file for calculating the G coupling constants here. See also the PRL "Dynamic correlators of Fermi-Pasta-Ulam chains and nonlinear fluctuating hydrodynamics" below and the paper by Herbert Spohn "Nonlinear fluctuating hydrodynamics for anharmonic chains", J. Stat. Phys. 154, 1191-1227 (2014). Matrix-valued Boltzmann equation for the Bose-Hubbard chain in the kinetic regime, including a theoretical derivation and numerical simulations. Concerning the Fermi-Hubbard chain, see the papers below. Kohn-Sham DFT calculations with the SCE functional, implemented using C and Mathematica. A slightly improved version of the C source code and a Mathematica demonstration file can be found at GitHub. For the underlying theory of nonlinear fluctuating hydrodynamics for anharmonic chains, refer to arXiv:1305.6412. A Mathematica package and demonstration file for calculating the coupling constants can be found at GitHub. Similar topic as in "Kantorovich dual solution for strictly correlated electrons in atoms and molecules". I'm responsible for the calculations involving small atoms in the paper. Follow-up paper for the non-integrable case. I am mainly responsible for the numeric part, which requires more sophistication than the integrable case to adopt the conservation laws in the numeric discretization. The (slightly improved) C / Mathematica source code for the simulations can be found at GitHub. We develop a nested optimization method to solve the Kantorovich dual formulation of optimal transport directly, with applications to atoms and small molecules. ELCVIA 12(1): 1-16 (2013) [journal link]. Based on the Radon transform implementation in the software section, but for fan-beam geometry. The time-dependent Wigner function is matrix-valued due to spin. The paper presents a fast algorithm to calculate Coulomb/exchange integrals of prolate spheroidal electronic orbitals, which appear in di-atomic molecules. The Mathematica code used for the calculations in the paper is available at GitHub. This paper descibes the FermiFab Matlab and Mathematica toolbox (available at GitHub, formerly at SourceForge), focusing on the implementation details based on integer bitfields. Several Mathematica notebooks used for the calculations are available here: [zip]. The FermiFab toolbox (also see above paper) has originally been developed to perform the symbolic and numerical calculations described in this paper. Basically a compact version of my physics diploma thesis. Kinetic Theory of the Dyakonov-Shur Instability [pdf] (March 2018). Talk at the APS March meeting 2018, Los Angeles, USA. Matrix-valued Quantum Boltzmann Methods [pdf] (November 2016). Talk at the KI-Net Young Researchers Workshop: Stochastic and deterministic methods in kinetic theory, Duke University, USA. Searching for the Tracy-Widom Distribution in Nonequilibrium Processes [pdf] (October 2016). Talk at the Mathematical Physics and Probability seminar, UC Davis, USA. Determinant quantum Monte Carlo algorithm for simulating Hubbard models [pdf] (July 2016). Talk at the workshop "Mathematical and numerical analysis of electronic structure models", Roscoff, France. Doping dependence of ordered phases in the Hubbard-Holstein model [pdf] (March 2016). Talk at the APS March meeting 2016, Baltimore, USA. Low temperature dynamics of the one-dimensional discrete nonlinear Schrödinger equation [pdf] (February 2016). Talk at the workshop "New approaches to non-equilibrium and random systems", KITP, UC Santa Barbara, USA. Kohn-Sham density functional theory in the framework of "strictly correlated electrons" [zip] (April 2014). Talk at the "Workshop on Mathematical and numerical analysis of electronic structure models", Konrad-Zuse Institut Berlin, Germany. Optimal transport limit of the Hohenberg-Kohn functional: Kantorovich dual solution and reduced density models [pdf] (June 2013). Talk at the SIAM Conference on "Mathematical Aspects of Materials Science", Philadelphia, USA. Efficient algorithm for two-center Coulomb and exchange integrals of electronic prolate spheroidal orbitals [pdf] (February 2012). Talk given at CERMICS, Ecole des Ponts ParisTech, Paris, France. 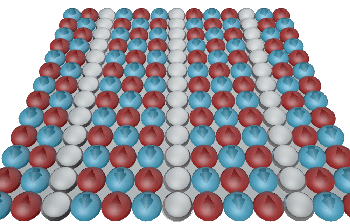 Electronic structure of 3d transition metal atoms [pptx] (June 2011). Talk at the Oberwolfach Workshop "Mathematical Methods in Quantum Chemistry", Germany. Unital quantum channels [pdf] (December 2007). Talk about unital quantum channels at the MPQ theory division Ringberg 2007 meeting, Germany. Generalized functions [pdf] (March 2006). Justification of some special fundamental solutions to well known partial differential equations in the sense of generalized functions.